Ronn McFarlane has been a fan of Celtic music since the 1970s. His latest album, The Celtic Lute, adds his own voice to that musical tradition by way of an instrument he fell in love with decades ago  the lute. "When you're playing the lute, the back vibrates. And so, having that vibration right there on one's chest as you're playing  it's a very pleasurable, very intimate sensation." 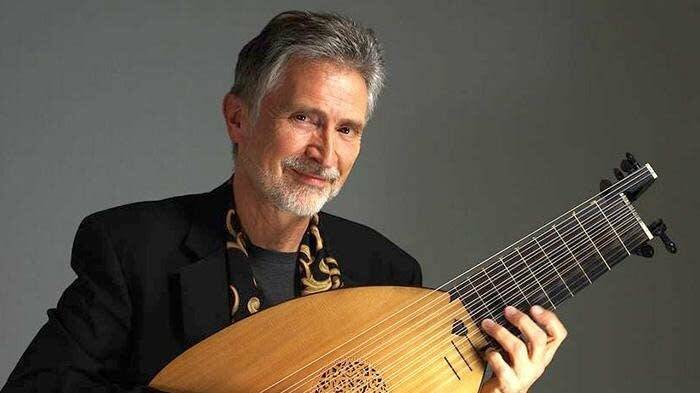 40 years ago, Ronn McFarlane, who you might know as a longtime member of the Baltimore Consort, put down his electric guitar and picked up the lute. "I thought that classical guitar would improve my rock playing. I had heard that it would, and I think it did. I took classical guitar lessons and found that I loved classical music, and of the classical guitar music that I played, I loved the old music most of all  the Renaissance and Baroque music, most of which had originally been lute music. I eventually wanted to hear and feel what it was like to play this music on the instrument it was originally written for. "I tried one out and found that it was extremely awkward. This rounded back felt completely unnatural to me. But I loved it and I kept playing. I kept at it. And it just began to feel like a natural extension of my body after a while." Ronn McFarlane's new solo recording is titled The Celtic Lute. On this release, he's playing a Baroque lute. "On this new album, which is Scottish and Irish music mainly from the 17th and 18th century, I'm playing a lute from that same time period. So, I have 13 courses of strings which means 24 strings altogether  a single treble and a single second string. Then all the rest are either in unison pairs or octave pairs in the bass. "The idea of having so many strings was actually to try to make the lute easier  that is, easier for the left hand to play  because all these bass notes could then be played on open strings and not stopped with the left hand. So, it's not truly easier, but it is different, and it gives you a lot of ringing  a sort of almost a harp-like quality  that allows strings to ring through one another in a way that earlier lutes could not." It's interesting that you refer to this harp-like quality because many of the pieces on this recording were written by a famed Irish harper, and as I was listening to them I was thinking, "Wow! It sounds like you're playing the harp." "I think so too. And I was delighted and a little surprised at how easily and naturally Turlough O'Carolan's harp music fit on the baroque lute. In fact, I rarely even had to change keys from O'Carolan's original keys, and it just felt like a natural fit. I was absolutely delighted by that, because I've loved his music for many years, but had not tried it tried it out on the lute until pretty recently." Is there a piece on this recording that turned out maybe better than you anticipated once you sat down and worked on the arrangement? "Yes actually. Sheebeg and Sheemore, which is one of O'Carolan's more famous tunes did turn out really well and it was one of the early ones that I tried out. Maybe that one gave me the courage to try out more and more of O'Carolan's pieces because it did turn out especially well and fits well under the fingers." What is a traditional Irish slip jig? "Oh, a slip jig is a jig in 9/8 time and I believe it has its own separate choreography though I don't know literally how to dance it. But it has very much the jig feel but in 9/8 time and so that creates a kind of a rolling quality. Pieces on this album that are slip jigs would be The Butterfly, The Kid on the Mountain, Hey My Nanny and one called Guzzle Together." Ronn McFarlane  getting in touch with his own Gaelic roots, on his brand-new recording, The Celtic Lute.